Continue on the culinary journey of discovering Italian cuisine through the areas of central Italy and discovee where focaccia, pesto, Parmesan cheese, cured ham, artichokes and truffles come from. Restaurant reviews, menu aggregator, social network and educational food blog for diners and drinkers! In part 1 of this series, I discussed general differences of Italian regional cuisine, north to south, and began to dissect the distinct cuisines of Italy's north. Heading out of the northern climes of alpine borders and Po river plains, let's continue our culinary journey on to the central portion of Italy. Liguria is a small region bordered by the Ligurian sea, Alps and Apennine mountains and containing both the Italian Riviera and Cinque Terre as part of its coastline. One of the most well-known products of Liguria is its pesto, made from the abundant basil that thrives in the coastal climate, mixed with the delicate local olive oil produced from the Taggiasche olives and finished off with garlic, pignoli nuts and Parmigiano cheese. Pesto finds it way into many dishes beyond pasta and gnocchi, including being mixed into green beans and potatoes. Pansotti, a triangular shaped pasta filled with ricotta and chard is usually served in a walnut sauce. Another pasta specialty of Liguria is the unusual Corzetti disks. These half-dollar sized flat pasta disks were at one time hand-stamped with the family crests of the local nobility. It is usually served with a meat sauce, though meat dishes are less common here with emphasis more on fish, chicken, and rabbit. Braised rabbit in white wine with olives is a favorite. Focaccia, a soft, thick flat bread dotted with holes that holds the brushed-on olive oil and preserves the moisture, is popular throughout all of Italy with countless variations. It is thought to have originated with the Etruscans or Greeks, but is now largely associated with Ligurian cuisine. Some variations bear little resemblance to the customary wedges topped with salt and herbs or onions, thinly sliced potato, meats and cheeses. The Focaccia di Recco variation is an extremely thin double crust that has been liberally dotted with local Crecenza cheese and baked crisp. Legend has it that the monks of the abbey of San Fruttuosa fed this foccacia to the Crusaders as they departed Italy. Notable desserts are fried milk and Pandolce, a favorite Christmas cake, more like a sweet focaccia than a Panettone. Wines from Liguria are mostly whites with DOC wines made from Bosco, Albarola and Vermentino grapes. Reds to look for are Rossese di Ventimiglia and Ormeasco. Sciacchetrà, a sweet amber-colored dessert wine, is a regional pride and joy. Emilia-Romagna is comprised of two former independent regions whose name is a legacy of ancient Rome. Emilia derives from via Æmilia, the name given to what was the main Roman road connecting Rome to northern Italy. Romagna derives from Romania, which was the name of the eastern reach of the Roman Empire. One of the most famous regional culinary heritage would no doubt be Parma's ham and its most imitated cheese, Parmigiano Reggiano. They say that this most famous king of cheeses originated in the middle ages in the town of Bibbiano, and afterwards spread to Parma. The Reggiano part of the name is a nod to its origin story and seems a source of consternation. The much beloved balsamic vinegar is produced throughout all of Emilia-Romagna, and not just its most famous town of Modena. Pasta of this region are generally rich egg pasta dough and can be filled with meat, cheese, or vegetables. Notable pasta includes tagliatelle, strozzapreti (which translates as "priest stranglers"), lasagna, tortellini and cappelletti. 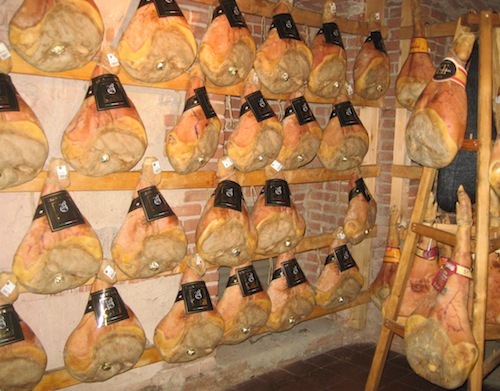 There is a wide range of cured meats beyond Parma ham, most notably being coppa, pancetta, cotechino and Mortadella which bares little resemblance to the mangled American namesake "Baloney." Make sure to find the small bars or specialty quick stops that will feature Piadina, a flat bread similar to flour tortillas that can have all sorts of sandwich-type fillings or L'erbazzone reggiano, a savory, usually double layered pastry filled with cooked chard or spinach spiked with pancetta and parmigiano, cut in wedges or squares. Consider a local Trebbiano white or sparkling Lambrusco to pair alongside. In Toscana (Tuscany), we begin to find ourselves solidly in the central heart of Italy. The landscape and cuisine begins to shift away from butter as a dominant ingredient. Olive oil plays more of a central role in the cuisine, often as a condiment or finishing touch to many dishes like tomato- and garlic-topped Bruschetta topped and Tuscan cannellini bean soup come to mind. Tuscans are sometimes affectionately referred to as "bean eaters," as their love of beans is well known. Tuscany has so many different types of Pecorino, or sheep cheese, that it can be surprising how varied one type of cheese can be. The distinctive salt-free bread of Tuscany has taken many visitors by surprise, but is a good match with salty cured hams and pecorino cheese. Tuscan bread plays a central roll in many dishes such as Panzanella, a tasty bread salad or Ribollita, a classic stew featuring yesterday's vegetable minestrone with beans and bread. Wild boar and rabbit sauces are paired with the long wide pappadelle egg noodle or perhaps with Pici, long strands of hand-rolled pasta. The Bistecca Fiorentina is a memorable T-bone or porterhouse cut of beef, weighing around 2 1/2 to 3 pounds, served rare and usually eaten by at least two people. A simple plate of Cantucci or almond biscotti, as they are known in America, served with Vin Santo, blessed sweet dessert wine, to dip them in is a great finish to most any meal. Well-known regional wines include Brunello di Montalcino, Chianti, and the refreshing white Vernaccia di San Gimignano. Umbria is sometimes overlooked when it comes to cuisine, but has many distinct dishes of its own. 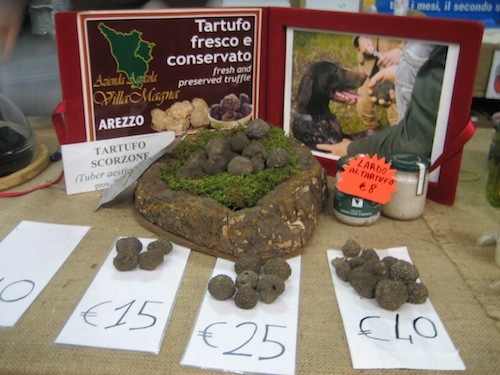 Black truffles are plentiful and find their way into much of the cuisine, whether pasta or meat dishes. Umbrians have a love for grains and grow Farro, an ancient and nutritious cousin to wheat. Farro features in baking and as a whole grain for salads and soup. Umbria is known for its locally grown lentils, traditionally eaten throughout Italy on New Year's Day with cothecino, or pig trotters, to bring prosperity for the coming year. Umbrians enjoy lentils throughout the year with fennel sausage or pureed and topped with seafood. Roasted meats infused with herbs are a common method of preparation and you will find fennel-infused roasted whole pork at fairs and special occasions. Around Lake Tresimeno, enjoy a delicate mixed fish stew called Tegamaccio. Perugia has become almost synonymous with Baci Perugina, a dark chocolate enrobed hazelnut kiss, or Bacio ("kiss"), that comes with a love note in every one. If you haven't tried one, you really must. Umbria is best known for its white wines; Orvieto, produced in Trebbiano, is the most well known. Montefalco Sagrantino and Torgiano Rosso are the notable red wines of the region. Le Marche's (Marche) regional name derives from the fact that for many years, the land was divided and ruled by local lords (Marquis), or in Italian, Marchese, and are now known by the plural of this name. The Marchigiani people are very fond of meat and a popular offering is large platters of grilled meats, grigliata mista di carne, cooked with the liberal amounts of garlic, rosemary, and fennel. Of course, along its long coastline, fish will be found in abundance. Brodetto, found around Anacona, is a fish stew with numerous species of fish. One of the most famous antipasti of Le Marche is Olive all'Ascolana from Ascoli: meat-stuffed green olives, battered and deep-fried, and definitely worth finding. You might also try ciauscolo, a soft, spreadable pork salame. Another unusual signature dish is a lasagna named Vincisgrassi, which at one time featured truffles and cured ham, although now it generally features chicken giblets, giving it a distinctive flavor. 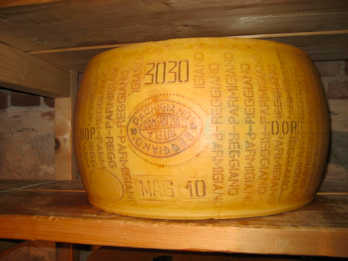 Pecorino cheese with fava beans in the spring is popular and if you can, find the strong variety of pecorino called formaggio di Fossa -- it is aged in limestone holes in the ground and sealed up till ripe. Well-known wines are whites Verdicchio, Falerio, Rosso Piceno Superiore, and Sangiovese dei Colli Paseresi. Lazio is a largely flat region with rolling hills, whose history and cuisine is firmly tied to its most famous city, Rome. 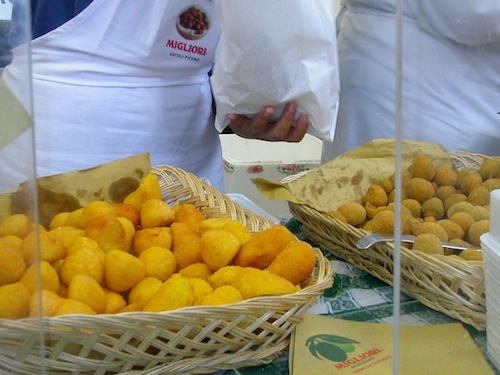 Lazio's culinary roots stretch back to ancient Rome and its gastronomic indulgences. This area is fond of its Pecorino sheep cheese. They make a divine crostata di ricotta, flavored with citrus and Marsala wine. An intriguing springtime Roman specialty is l'abacchio alla cacciatore, a spring lamb cooked in vinegar with sage, rosemary, garlic and anchovies. Romans are fond of Spaghetti, so do make a point to try some. Most recognizable is Spaghetti carbonara but seek out Cacio e Pepe, a cheesy, creamy pasta with lots of black pepper. Spaghetti all'amatriciana features a salt-cured pork jowl, guanciale, that elevates the sauce a step beyond pancetta. 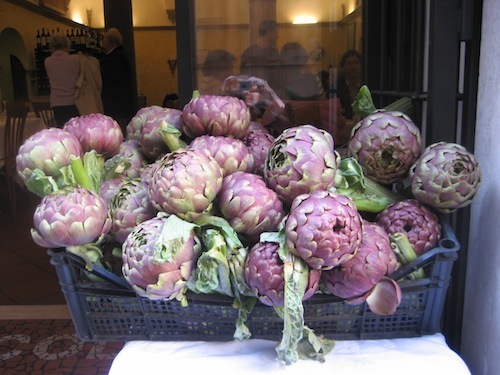 Another passion in Lazio is globe artichokes. These gorgeous rounded thistles run the gamut from decoration to finding a place in just about every corner of the menu. Aside from the braised, sautéed or marinated artichokes served either on their own or together in a dish, they are simply divine when fried. Fried whole, these artichokes make a dramatic presentation, although individual slivers dusted in flour and fried crisp are hard to resist. Frascati white and Cesanese del Piglio red are two of the best examples of the local wines. Here we shall take our leave from the cuisine of the central portion of Italy and continue on to the southern cuisine of the southern and Sardinia in the third and final portion of my guide to regional Italian cuisine. Stay tuned. Italian Regional Cuisine: Part 2 of 3 originally published on the Menuism Italian Cuisine Blog. Marla Gulley Roncaglia is an American expat living in the Italian Alps. Marla is an accomplished pastry chef, and a master at high-altitude baking. She and her husband Fabrizio (who has also worked as a chef) teach Italian cooking classes and run a bed and breakfast named Bella Baita ("beautiful mountain house"), where they are active supporters of the slow food movement.